The French foreign minister has said Lebanese Prime Minister Saad Hariri can travel "when he wants" to France from Saudi Arabia, where officials in Beirut allege he is being detained. Jean-Yves Le Drian was speaking at a joint news conference in Riyadh after talks with his Saudi counterpart. Adel al-Jubeir said the claim that Mr Hariri was being held was "false" and he was in Saudi Arabia by his own will. Mr Hariri resigned unexpectedly during a visit to Saudi Arabia on 4 November. On Wednesday, Lebanese President Michel Aoun for the first time publicly accused the Saudi authorities of holding him, saying "nothing justified" his absence. For his part, Mr Hariri insisted that he was fine and would soon return to Lebanon. Saudi Arabia has denied forcing Mr Hariri to resign in an attempt to curb the influence of its regional rival Iran and its Lebanese proxy Hezbollah, which is part of a national unity government that Mr Hariri formed last year. France, Lebanon's onetime colonial ruler, has been trying to mediate in the crisis. Its position is that Mr Hariri should be allowed back to Beirut to resubmit his resignation in person, reports the BBC's Hugh Schofield in Paris. For the moment that option is unacceptable to the Saudis, so a compromise appears to have been arranged under which the prime minister travels to Paris, where he has extensive personal and business connections, our correspondent adds. On Wednesday, as Mr Le Drian arrived in Riyadh, President Emmanuel Macron announced that he had invited Mr Hariri and his family to France after speaking by telephone to the prime minister and Saudi Crown Prince Mohammed bin Salman. Mr Macron was later forced to clarify that he was not offering political exile, and that he expected Mr Hariri to stay only "for a few days". On Thursday, France's foreign minister told reporters: "Mr Hariri - who I will see later - is invited to France with his family by President Macron. He will come to France when he wants and as soon as he wants. He will be welcome as a friend." Mr Jubeir meanwhile rejected accusations that Mr Hariri was being detained. "Hariri lives in the kingdom by his own will and he resigned," he said. 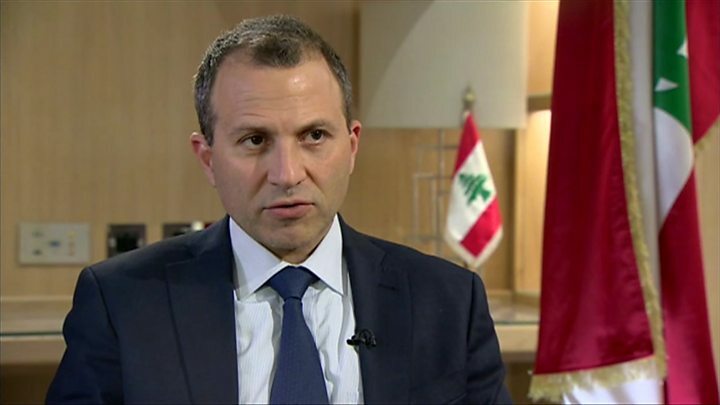 "Regarding his return to Lebanon, it is up to him and his assessment to the security situation." Mr Hariri has close ties to Saudi Arabia. He holds both Lebanese and Saudi citizenship, owns properties in the kingdom, and Riyadh is a key backer of his political party, the Future Movement. 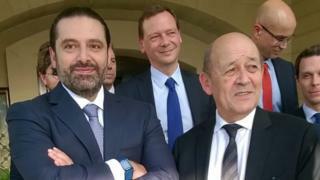 Mr Le Drian later held what he called a "friendly and trusting meeting" with the Lebanese prime minister, who he said would "soon come to Paris". AFP news agency reported that when asked when he would leave Riyadh, Mr Hariri told reporters: "I would rather not answer that right now." The Lebanese presidency's Twitter account earlier quoted Mr Aoun as saying: "I am awaiting the return of Prime Minister Hariri from Paris for us to decide the next step with regards to the government." Our correspondent says the stage seems set for a long period of behind-the-scenes diplomacy, involving Saudi Arabia, France and all of Lebanon's different political and religious groups, to see under what circumstances Mr Hariri might eventually be able to return. Mr Hariri announced his resignation in a televised address from Riyadh, in which he accused Iran of sowing "discord, devastation and destruction" in the region and said he sensed there was an assassination plot against him. His father Rafik - himself a former Lebanese prime minister - was killed in a suicide bombing in Beirut in 2005. Several members of Hezbollah are being tried in absentia at a UN-backed tribunal at The Hague in connection with the attack, though the group has denied any involvement.